Wood-look porcelain tile is incredibly popular with individuals who wish to have the look and feel of wood floors without the maintenance requirements. Many people can’t tell the difference between the two materials even when the two are side-by-side! So when the tile has been installed, a natural next step is choosing a rug to complete the wood floor look. We are bringing you some tips and advice about how to choose a rug that will enhance the beauty of this new floor! Finding just the right size area rug can feel like an overwhelming task. Armed with a few tips and tricks, you are sure to navigate like an expert as you embark on the hunt for your next area rug! If you are looking for an are rug to fit your living room, there are a few quick rules to follow that will ensure you find the correct size for your room. The first order of business is to measure the area used by your seating furniture (couches, chairs, etc.). Using this measurement, look for a rug slightly larger. With larger rooms, it is important to make sure that your furniture legs sit on the rug in order for the piece to anchor your room. 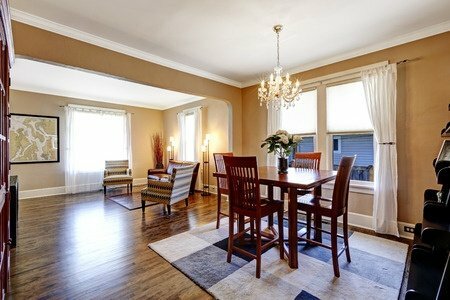 Another frequently asked question is whether or not to orient the legs of your furniture on the rug or off. There is no right answer but overall a room will look best if it follows the above guidelines. If you are forced by the size of a rug you’ve already purchased, be consistent. If one sofa has one set of legs off, than all other furniture should follow suit (minus the coffee table of course). So what about the tone of the rug? Should you choose a dark rug? A light rug? In general, if a space has dark furniture, it will be beneficial to select a lighter area rug. This will keep your room from feeling too heavy and burdened. If your room has a lighter touch to it, with light furniture, you might consider a more grounding earthy or deep color. These are just a few ways you can help narrow down the search for your area rug. Once you know the size to look for your decisions should be much easier. We wish you the best of luck and hope you find perfect rug for your space!